For some it’s a luxury, for others it’s a chore, but these days more and more people are working from home. 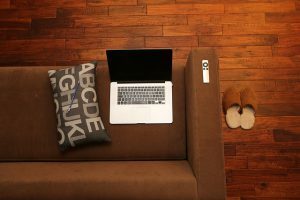 Instead of looking at the positives and negatives of home office life, in this article we will be shooting out some ideas on how to make home office life as comfortable as possible, especially for small homes. That’s right, to have a home office, there is no need for huge extra space or even a spare room. Whether its your bedroom, kitchen or living room, by incorporating some of these ’10 home office ideas for small spaces’, you can make home office life a whole lot better. A home office does not need to be in traditional places like your living room or dining room. Have a look around your home for some nooks and crannies that you can fit a little desk inside or under. You may have to convert some of these places to free up some space, however if it isn’t being used, then converting it could be a nice investment. Examples of areas that you may not have thought of are: under a stair case, turning a walk-in-closet into a place to have your desk and mini cabinet, an attic office, a basement or utility room office, behind a sofa or how about in an alcove or unused corner. A small office space really doesn’t need a large area. If your home space is really at a minimum, then why not attach a fold down desk to one of your walls. Fold down desks can be folded up when not in use, taking up barely any space when you are not working. This one is thinking outside the box, however we like to think outside the box at Best for Small Spaces. I personally like to stand when I work at home, as sitting down for long periods is not very healthy. Having a small desk converter is a great way of turning a regular desk into a standing office desk. Just place the desk converter on top of a regular table, and voila, you have a specially designed office desk with the benefits of standing while working. This little desk is great for small spaces because it can be easily stored away when not in use. Corners of rooms are very underused areas and if you want to make the most of your small home then getting the most out out of every corner is a must. Getting a corner office desk is a great way of using this free space and corner desks look great also. If you need to store files and documents in your home office, then consider a cabinet. Cabinets can be bought in varying sizes, therefore it would be worth your while paying attention to where you are going to store it. If you would like to have your cabinet under a desk then a small cabinet would be the obvious choice. However, if space is limited and you can’t place it under the desk then a narrow cabinet can also be an option. A narrow cabinet is usually tall, will take up less width and use more of the vertical space. A lot of office materials can be placed on shelves, freeing up space on the ground. As we repeat many times in this blog, using space higher up, leaves a lot more free room lower down. By setting up shelves on the walls, files and books can be stored on them and not on the ground. Floating desks do not actually levitate, however they are leg free. A floating office desk is attached to the wall, something similar to a drop down desk, except they look a little bit classier. With a floating desk you can keep your laptop, files and other essentials on the desk and also push your chair underneath when you are finished working. A floating desk is not as deep as a regular desk, therefore will take up less space. Dual purpose furniture are wonderful items to have in small homes. We have already talked about sofa beds and box seats & benches, however, how about a ‘lift up top’ coffee table. At first view it looks like a normal coffee table but with a little adjustment, the top can be lifted towards you making a ready made work desk. An added bonus is the little storage space underneath the top which can be used to store your office things in when you are finished work and have closed down the coffee table top. How about a mobile workstation that allows you to wheel your office to different parts of the house. 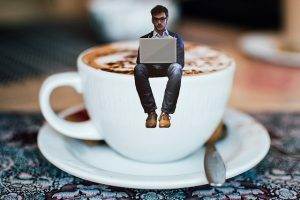 For example, if it is a little noisy in the living room, you can wheel your mobile office desk into the kitchen to work in peace and quiet for a couple of hours. The beauty of these mobile office desks on wheels is that they are quite small and compact but can usually be extended to place keyboards and other items when needed. How about setting up your office desk in your child’s room. By day it can be your office desk and in the evening it can be your kid’s homework desk. In small homes we have seen the benefits of dual use furniture, so now we can see the benefits of multiple family members sharing certain furniture. 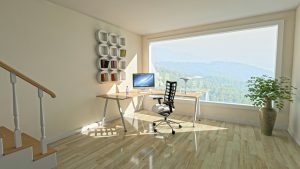 A small office might seem like too much to ask in a small living space, however as you can see there are many ways to make it happen. A complete small office is definitely doable in most living spaces. Just be creative and chose the best items and the best spots to place those items and you will find that you have all the space you need to set up your very own home office. I hope you found these ’10 home office ideas for small spaces’ useful. Let us know if any of these ideas worked for you.